The initial camera position (for calibrated and uncalibrated cameras for which the initial position is known). The calibrated camera position (for calibrated images). The camera associated image thumbnail (for calibrated images). The camera information is also displayed when selecting a given camera in the Layers section of the left sidebar. Camera: Name of the image associated to the selected camera. 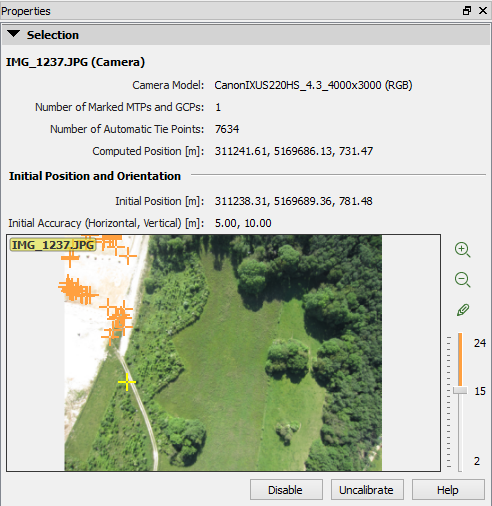 Camera Model: Camera model associated to the selected camera, including Image size in pixels (widthxheight) and band configuration. Number of Marked MTPs and GCPs: Number of Manual Te Points / GCPs marked on the image. Number of Automatic Tie Points: Total number of matched keypoints found on the image. Computed Position [units]: X, Y, Z computed position of the camera. Disable: Disables the image. In order to remove the camera from the reconstruction, the project needs to be reoptimized. This button is shown for enabled cameras. Enable: Enables the image. In order to include the camera in the reconstruction, the project needs to be reoptimized. This button is shown for disabled cameras. Uncalibrate: This option should be chosen if the user is not confident about the calibration of the camera. Apply: (available when the Image Annotation tool is used): Applies the image annotation. Image preview: Displays the image associated to the calibrated camera. Orange cross: Represents the position of an automatic keypoint that has been matched with keypoints from other images. Yellow cross: Represents a Manual Tie Point or a GCP marked on the image. Right slider: Allows to select the minimum number of images with which a keypoint has been matched. Zoom in: Zoom in on the image. Zoom out: Zoom out of the image. Image Annotation: Activates the Image Annotation mode. Global Mask: The pixels annotated are propagated to all the images. All these pixels are not used for processing. Suitable for a consistent obstacle on all the images, e.g. the foot of the drone. 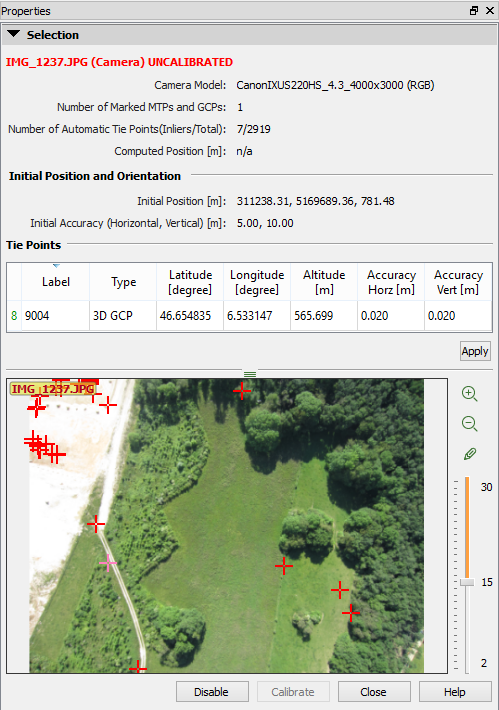 For more information: How to remove obstacles from the point cloud in the rayCloud using the Annotation Tool. In order to zoom in/out: Place the mouse over the location on which to zoom, and move the mouse scroll button forwards/backwards. In order to pan: Place the mouse over the location on which to pan, and press the left mouse button while dragging the mouse. By placing the mouse over an image and typing space, the image is displayed in full screen, where is possible to zoom, pan, click, etc. Space: Minimizes the image and keeps the full screen zoom and panning level. Esc: Minimizes the image and keeps the previous zoom and panning. When double clicking on a cross in the Image preview (Automatic/Manual Tie Point or GCP), the Images section displays the images where the point can be found (including the currently selected image). For more information: Menu View > rayCloud > Right sidebar > Images section. When selecting an uncalibrated camera, it can be manually calibrated. Number of Automatic Tie Points (Inliers/Total): Inlier points and total number of matching keypoints found on the image. Computed Position [units]: X, Y, Z position of the computed camera. Since there is no computed position, it appears as n/a. Calibrate: Allows to calibrate an uncalibrated camera. This button is enabled only if more than 20 Manual Tie Points and Automatic Tie Points are considered as being inliers. Close: Exits the manual calibration mode. Note: For step by step instructions about how to calibrate a camera: How to manually calibrate uncalibrated Cameras in the rayCloud. Image preview: Displays the image associated to the uncalibrated camera. Red cross: Represents the position of an automatic keypoint that was not matched with keypoints of other images. Orange crosses: Represents the position of an automatic keypoint which has a high probability of being accurately matched with keypoints of other images. Yellow crosses: Represents a Manual Tie Point or a GCP marked on the image. Right slider: Allows the user to select the minimum number of images with which a keypoint could be matched. Global Mask: The pixels annotated are propagated to all the images. All these pixels are not used for processing. Suitable for a consistent obstacle on all the images, e.g. the foot of the drone. For more information: How to Annotate Images in the rayCloud. In order to pan: Place the mouse over the location on which to pan, and press the left button while dragging the mouse. Tie Points section: Displays in a table information about the Manual Tie Points and GCPs that are marked on the selected image. The table allows to edit the information about the Tie Points by double clicking on the corresponding cell. For detailed information: GCP / Manual Tie Point Table. Apply: When clicking on this button, the new marks or changes for the displayed Manual Tie Points and GCPs are added to the project. When double clicking on a cross in the Image preview (Automatic / Manual Tie Point or GCP), the Images section displays the images where the point can be found (including the currently selected image). For more information: Menu View > rayCloud > Right sidebar > Images section.